Why are you collecting board games? What do you know about board games? Where can you find out about new board games? Where can you buy board games and where can you sell them? How much are board games worth and are they a good investment? There are two main reasons to be starting a board game collection. The primary reason is because you want to play the games. Board games are great for social occasions. Get your family and friends together for game night. Buy some munchies, get some games out and enjoy yourself. This can be competitive – beating your best mateÂ at a tightly fought game of Risk brings bragging rights – or just a chance to relax and share time together. If you want to take it further you can find a local board game club and join them. Turning up with an existing number of games – particularly new ones the members do not know – is a good way to break the ice. Members of a club might want to start a collection that they can each share and use. That way an investment of say $40 or Â£30 each for ten members gives you a nice library of games, whereas a single member may not be able to afford to buy ten games himself. You can find local clubs on Board Game Geek (see useful links below) or via Google. Another reason for starting a collection is to consider it as an investment. Board games do have value and some rare/out of print games can fetch a premium. This aspect is explored later in the article. and at this point he scratches his head says “er Â …Trivial pursuit” and then grinds to a halt. This just scrapes the surface, but time spent on Board Game Geek should prove worthwhile. The likes of Wallmart and Toys R Us generally do not release many genuinely new games. Most games there are reprints of Cluedo or Monopoly or quiz/TV/movie tie in games. These are seen as safe sales. Every family will buy some sort of such game each year. The big companies are really not interested in the much smaller market of the hobby gamer. If you want to find out about the exciting and new in terms of board games you can subscribe (for free) to Board Game Geek or join (for $10 a year) Board Game News – a site designed to keep the industry and the keen gamer aware of the latest news. Another very fun way of learning about new games is to attend a games convention. In the US the biggest conventions where board games will feature are Origins Â and Gencon Indy, drawing crowds of 30,000 to 50,000 attendances. In the UK the author’s own convention, UK Games Expo, is the largest such event with 3500 to 4000 attendances. The biggest convention in the world is Essen Spiel in October in Germany with over 100,000 attendances over the very full and busy 4 days. If you are serious about this subject then a trip to this Mecca of board games is not to be missed. A very small range of board games are sold by the large chain shops. Since the high street stores do not have an exciting selection, it is necessary to look elsewhere to start your collection. There are four main sources of board games. Online purchasing via games retailers. Googling board games should yield a vast range of companies selling board games. You are advised to shop around and compare prices as there is often a spread of prices for the same game. Here in the UK, Leisure Games, Spirit Games and Games Lore are just three worth looking at. Online purchasing via auctions. Ebay auctions often yield out of print games as well as deals on new games. It is also worth looking at Board Game Geek which offers members a market place – both using real currency and BGG’s own Geek Gold. These sites offer you the ability to sell unwanted games from your own collection. Buying from a games convention. Again this is the most fun method. Attending a convention provides the opportunity to ‘try before you buy’ as you can sit down and play a game as well as seeing many out of their box on display which you don’t get at a high street store. Often there are deals on offer at conventions which allow for cheaper purchases, although you have to factor in admission prices of course. Most conventions will have a flea market/ bring and buy/ second hand area where you can sell your games. Usually you pay 10 to 15% commission to the convention or whoever is running the flea market. Buying from a bricks and mortar hobby games store. These are not usually on high streets and you need to Google to find them but there are for example at least 30 such shops in the UK alone. Prices are usually higher at a physical shop than online, but the advantage is that the hobby shop owner often knows about games and can discuss them intelligently with you. Furthermore over time you can develop a relationship with the shop owner. Shops will usually buy games off you or allow customers to sell games in the store, again for commission. The value of a board game will depend on the quality of it. That usually means it is complete with no missing components, the board is not bent and the box not scratched. Another factor will be its rarity and also whether it has obtained a cult status. Thus an out of print popular game might yield more than an in print current game that is not rated highly. Here a study of BGG ranking system, to see how popular games are, can be useful. It is possible to make money buying and selling board games but do not expect to make a fortune quickly. Trawling round conventions, pouring over the flea markets, visiting shops and digging in the bargain buckets and lucky finds at car boot /yard sales might just yield a rare out of print game. First editions of classic family games can sometimes appear on Ebay and occasionally Â go for a large fee. For example right now on Ebay UK you can find a copy of the Â Buccaneer Game By Waddingtons 1958 up for auction at Â£159. Old Avalon hill wargames (the type with 2000 cardboard counters in) are often in great demand particularly in the USA if they are of good quality and not missing pieces. A more modest but more regular income can be obtained buying up many less rare games and putting up a web store or selling on Ebay. Readers are advised to study Ebay and BGG market place prices. Keeping an eye on forum postings where people state what they want to buy is also worthwhile. 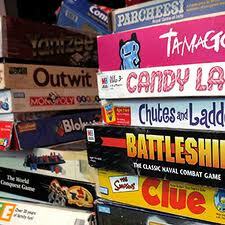 There are certainly many individuals who turn a nice profit buying and selling board games. The advice here is get to know the market so you know whether that slightly dog eaten copy of Titan, in a charity shop at Â£1, might sell for Â£50 at the right place. All of that said the worth of a game to the writer is not financial. Not far from the keyboard being used for the writing of this article is a room with maybe 400 board games in. Every one of them has at some time found its way onto the table. The true value of a game to the gamer is not monetary, but rated in terms of how often you want to play it. Richard Denning is one of the directors of UK Games Expo. He is also the designer of the board game The Great Fire of London from Medusa Games.